Today I pre-ordered my copy of Book of Sith: Secrets from the Dark Side by Daniel Wallace at Amazon.com. Official release on February 10, 2012 (with my pre-purchase today and free shipping it said delivery estimate: Thursday February 16, 2012 - Saturday February 18, 2012). Going with our evil theme, I thought it necessary to know the “Secrets of the Dark Side” but any book that boasts about secrets seems to lose the secret effect once you publish to the masses. I will be sure to tell people who don’t like Star Wars or don’t particularly read that I will know secrets they don’t. At $62.98 quite a few people would question my purchase of just “a book”. This is not merely a book! To quote Amazon, “The black-and-red pyramid-shaped Sith case appears innocuous. But with the touch of a button, the door of the case lifts, accompanied by lights and Star Wars sound effects. The secrets within are revealed—the Book of Sith slides into view.” The pictures on the Amazon page give a good sneak peek of the inside and other parts. Definitely a fancy set up for a book. I have faith that I won’t be too disappointed because last year they released The Jedi Path: A Manual for Students of the Force [Vault Edition] by Daniel Wallace (apparently he turned Sith this year, after seeing the Jedi’s and their “good” side I am sure the Sith seemed more fun.). I received this as a holiday gift and was happy that they seemed to put a lot of thought into a release of a book. The “Vault” edition is a plastic box that needed some batteries (included), like the Book of Sith says in its description, with the touch of a button it opens up, making a totally official vault-opening sound. It is a small book, with just 160 pages but it includes some surprises tucked inside, like a severed Padawan braid, a metal Jedi Credit medallion, and a Jedi starfighter patch to name a few. A few months later I saw just the book on the shelves of comic book shops and other places and I said to myself “without all those little extras, this book isn't very interesting”. Adding “the vault” and extras with the book made it a collector's item and almost a toy. Not just some book to sit next to my Boba Fett coffee mug or on a bookshelf. 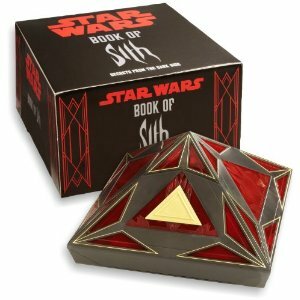 The Jedi Path was in a rectangle box but Book of Sith is in a pyramid. That should look cooler on my shelf. In this digital age when books are downloaded and paper is saved they have to make physical books more appealing to a collector and/or reader. So I expect the same quality as the previous book from Book of Sith. They even have the same exact page count. The information I read about the author seems like he would be a cool nerd friend. Anyone that lists “comic book expert, sci-fi sage, and lifelong geek” in this biography can't be all bad. He also co-wrote Star Wars: The Essential Atlas and other guides. You can read more about the author and his other nerdy publications on Amazon here: Biography of Daniel Wallace, Books By Daniel Wallace.